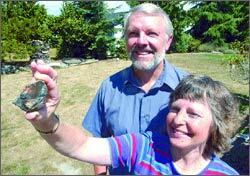 Mark and Gail Fredlund show off a rock they saw fall from the sky into their back yard in May. If the mystery rock is a meteorite, the Fredlunds might make geological history as the first Washingtonians in recorded history to have seen one hit the Earth. A Mount Vernon couple might make state history if the rock they saw fall from the sky a few months ago turns out to be a meteorite. In May, Gail and Mark Fredlund were in the back yard of their home northeast of Mount Vernon watching hummingbirds zipping around a feeder on a sunny afternoon when an unusually loud, whistling buzz caught their attention. They looked up in time to watch as a rock whacked into a coil of plastic yard edging at the border of the yard, kicking up a puff of dust before it bounced back about four feet onto the grass. "It came right over our house," said Mark Fredlund. "It was going so fast, I think if it hit the roof it would have gone right through it." According to University of Washington astronomy expert Toby Smith, there's a good chance Fredlund's flying rock really is a meteorite, because the rock appears to have magnetic properties. 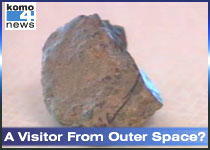 Finding meteorites is unusual in Washington, Smith said. Most of them just look like plain old rocks, so it would be hard to spot one in the Northwest's rocky landscape. The rock that landed in the Fredlund's back yard is about the size of a goose egg. They plan to take the rock to University of Washington astronomy experts later this month to determine if it is a meteorite. People often stop by the astronomy department with rocks they think might be meteorites. But in Smith's 10 years of teaching and doing research at UW, not one sample has turned out to be anything more than just a plain old rock. So if it turns out that the object is a meteorite, the Fredlunds may have made history as the first Washingtonians ever to see one hit the Earth. "If this really is the first time a meteor has been seen to fall, that would be unique," Smith said. No one would be more surprised to make Washington geological history than the Fredlunds. After all, they had a hard time believing their own eyes when they saw the rock hit the ground about 3:30 p.m. on May 1. At first, they suspected mischievous neighborhood kids had thrown the rock, but they looked around and saw no one. Mark Fredlund picked up the rock — it was cool to the touch — and looked at it more closely. It didn't look like anything unusual, just a rough, irregularly shaped rock about the size of a goose egg. Some of its surface had a reddish tint, like iron ore. A black seam ran down the middle of the rock, and part of it had a brownish crust. The Fredlunds took the rock into the house and searched the Internet for Web sites offering information about astronomy. They found a site that listed several ways to tell if an object is likely to be a meteorite, including testing to see if it will attract a magnet. They found a magnet, hung it from a string, held it near the rock — and sure enough, the magnet pulled towards it. With evidence mounting, the Fredlunds called UW to ask if an expert there might be able to take a look at the rock. They hope to meet Smith and several other astronomy researchers later this month. Aside from a few friends, no one else might ever have learned about the suspected meteorite if not for a curious neighbor's phone call to the newspaper this week. According to Smith, if the rock really is a meteorite, it likely came from the asteroid belt that stretches between Mars and Jupiter, or possibly even from the moon or Mars. If it's actually a chunk from another planet, the specimen could turn out to be more than just big news — it also could mean big money. While asteroid pieces sell on Ebay for $95 per pound, rocks that fall to the Earth from another planet can sell for as much as $60,000. Until they make the trip to visit the university's astronomy experts, the mystery rock is tucked away for safekeeping — except for when friends stop by for a visit. "Everybody wants to see the space rock," Gail Fredlund said. "The purpose of this site is to help the visitor better understand elementary identification of the most common meteorites and to gain insight from the misidentifications of others."